For the past few decades, the seas have become highly contaminated with plastic. So much so that we might end up with a pound of plastic for every three pounds of fish in the sea in just a few years. Usually only used once, disposable plastics are harming plants and animals alike, endangering public health and exacerbating climate change. Surrounded by water on three sides and sandwiched between New York City and Philadelphia, New Jersey has become ground zero for plastics litter. Most of the litter found on beaches is plastic, and scientists have found increasing amounts of microscopic plastic (microplastics) in the waterways of NJ and NY, including the upper Raritan and Passaic Rivers. Microplastics are now permeating our lives: it’s in the water we drink, in the fish we eat, and even in the air we breathe. To prevent this problem from getting worse, Clean Water Action's ReThink Disposable program is working with government, business and communities to help curb the use of single-use disposable plastic products, individually and collectively. While we have our work cut out for us, there is hope for the Garden State. Town by town, New Jerseyans are making incredible progress to curb plastic pollution. Nearly twenty New Jersey towns and cities have passed bag ordinances and many more may soon follow. There is groundbreaking legislation (A4330/S2776) moving in Trenton that would ban plastic carryout bags with a 10 cent fee on paper carryout bags to encourage shift to reuables, ban polystyrene foam food containers, and offer single-use plastic straws only upon request. With this leap forward, following in the steps of our neighbors in Europe, the Garden State could become the gold standard for the rest of our country to follow. We would significantly curb the use of wasteful plastics and lead the way in resolving one of the gravest environmental crises in history. But with great progress, comes great opposition. The American Chemistry Council (ACC), an oil industry lobbying group, has entered the fray to kill New Jersey’s best hope for waste-free waters. Plastic, you see, is made from fossil fuels. And, for fossil fuel companies and CEOs, as horrible as plastic is for our waters, health, and climate, slightly reduced quarterly earnings are apparently worse. Partially operating in-state as the “Chemistry Council of New Jersey,” the ACC has launched astroturf (fake grassroots) groups promoting highly deceptive talking points to tank the legislation. The ACC previously dumped $9.4 million into fighting a similar law in California. They failed, and California’s beaches and the Pacific Ocean will be cleaner for it. Moreover, the world did not end for grocery shoppers in Malibu. But this colossal sum of money is pocket change to a group whose donor list of fossil fuel barons reads like the guest list at a Great Gatsby party. The ACC has rebranded themselves as the “American Progressive Bag Alliance (APBA)” in their campaign to oppose NJ’s bag ban legislation and promote bag recycling as a viable solution. They couldn’t be more wrong. Recycling plastic bags is impractical and unrealistic: they almost always end up in the garbage or the general environment, where they only partially breakdown into smaller pieces (known as microplastics), enter waterways and even end up in our food. The ACC says they care about the impact this bill will have on jobs and low-income shoppers; however, their number one priority is to sell you fossil-fuel based (fracked-gas) plastics at a profit for their shareholders. In addition, there is likely to be no additional cost to retailers, as they will be phasing out purchases of high volumes of single use plastic bags. One Jersey Shore supermarket reported using 30,000 plastic bags a week, or 1,560,000 bags per year. No NJ bag manufacturer will lose jobs due to this legislative proposal as the only plant in state makes trash can liners and paper bags. Under A4330/S2776, all shoppers are incentivized to bring reusable bags to the store. This means that fewer bags are being buried and burned in NJ's 7 incinerators - largely located in low income and communities of color. Fewer bags are blowing in the wind, littering our neighborhoods and environment, and clogging our storm drains and waterways. A free single use plastic bag is no compensation for a child who can’t breathe due to emissions from a nearby incinerator or chemical plant. Reusables are the way to go! The wellbeing of our planet or the health of our children is what we should focus on, not the motives of chemical company opposition. By switching from single-use disposables to reusables, we are creating a strong foundation for a healthier planet for generations to come regardless of what zip code you live in. It is time to take action by contacting your legislators today. 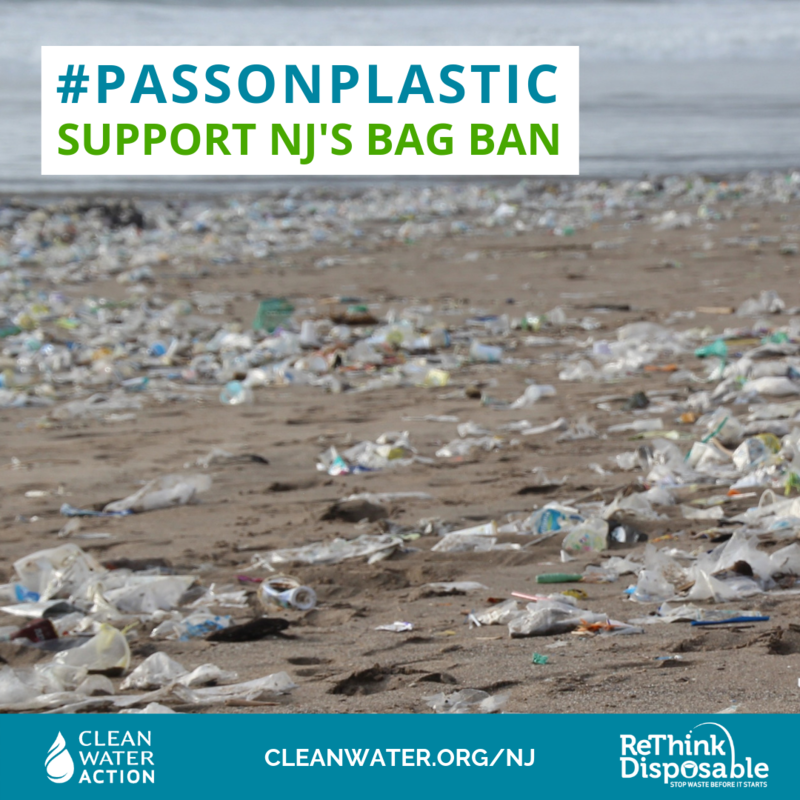 Urge them to support New Jersey’s plastic bag and Styrofoam ban (A4330/S2776).